Rheumatology Associates (Chicago) - Book Appointment Online! 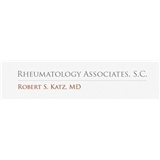 Robert S. Katz, MD, is a Professor of Medicine and a leading expert in the field of rheumatology with experience in both research and patient care. Dr. Katz was honored to be listed on U.S. News & World Report’s Top Doctors rankings, considered to be among the top 1% of doctors in his specialty nationwide. He was also recognized in Chicago magazine’s January 2012 issue as one of 494 top doctors in metro Chicago—chosen from the more than 35,000 medical doctors in the area. During a Congressional briefing in March 2012, Dr. Katz shared his experiences treating patients with lupus every day. “When you see a lupus patient who doesn’t look sick, it’s hard to imagine she suffers from a disease causing such fatigue and pain that she literally cannot make it to work or pick up her child from school,” Dr. Katz explained. Was great! Everyone working was very nice and gentle! I think I have found my doc! All the other doctors in Chicago have been condescending and impersonal. I noticed immediately that my spirits were up! Thanks doc!